A recent estimate suggests that employees endure a staggering 55 million meetings a day in the United States. This tremendous time investment yields only modest returns. No organization made up of human beings is immune from the all-too-common meeting gripes: those that fail to engage, those that inadvertently encourage participants to tune out, and those that blatantly disregard participants' time. Most companies and leaders view poor meetings as an inevitable cost of doing business. But managers can take heart: researchers now have a clear understanding of the key drivers that make meetings successful. 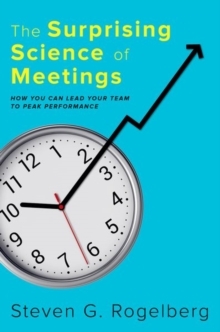 In The Surprising Science of Meetings, Steven G. Rogelberg, researcher and consultant to some of the world's most successful companies, draws from extensive research, analytics and data mining, and survey interviews with over 5,000 employees across a range of industries to sharethe proven practices and techniques that help managers and employees enhance the quality of their meetings. For those who lead and participate in meetings, Rogelberg provides immediate direction, guidance, and relief, offering a how-to guide to change your working life starting today.